I am not sure who started the one word craze but in 2015 my word was “Generous.” In 2016 it was “Focus.” I did not have one for 2017. I am not one to randomly pick a word the word has to come to me. 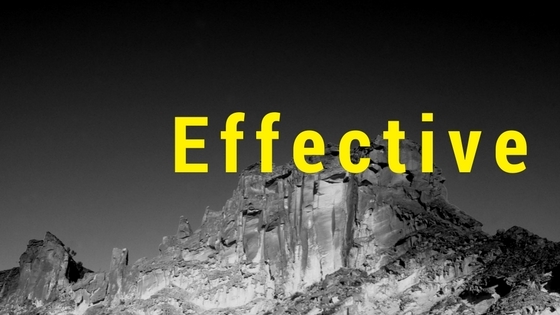 Our associate Pastor was preaching on New Year’s Eve and at the end of his message the word “Effective,” is what came to me for 2018. Also, by saying “come to me,” I am not trying to refer some supernatural spiritual event. The word, just popped in my head but when it did, I knew it was my word for the year. I think we have all experienced times where we have invested large amounts of effort only to fall far short of our purpose. It is easy for me to dream, and talk about my vision for the future. Talking about dreams can easily become a crutch, a way of playing it safe. As they say, talk is cheap. However, when you desire to effectively bring those dreams to a reality, you quickly realize failure is a real possibility. Effectiveness in life can only be achieved when we are willing to take risks. I pray that the Holy Spirit will cause me to be an effective witness for Jesus Christ and bring glory to God in all that I do. When December 2018 arrives I hope to be able to look back on the year and see the positive impact of my words and deeds. This will be the true judge of whether or not I have lived an effective life. Do you have a word for 2018? Share it with me in the comments. « Hello 2018 – Deserve Victory!